It gives us an immense pleasure to inform you that 9 out of 20 students who enrolled for our 2 month online crash course for NEET-II have successfully qualified NEET 2016! The credit goes to our academic and course planning team to launch a NEET short crash course in “doubt removal form” when SC ordered CBSE to conduct NEET-II on 24th July. A digital classroom where they can interact with teacher and ask their doubts, very similar to regular coaching classes. Recordings of the classes were provided for better understanding and revision. The course batch timing was suitable for them, where they took classes right from their home. Parents were also present in some initial sessions to get the feel of platform. Their instant reactions were like – very impressive, it (online coaching) really works! Online practice tests where their performance were analyzed and they improved their weaker areas. And finally, the helpful nature of the teachers and the counselling team which regularly motivated them to feel confident for the exam. We appreciate all students hard work to re energize again, you didn’t panic and successfully cleared the NEET 2016. This is also a message to all those who put question marks on the credibility of online coaching and the quality of teaching delivered via digital medium. Are you a medical aspirant targeting NEET/AIIMS in 2019 and later, and you have computer/laptop and internet connection at home, checkout a Free Demo Class. We run only light batches (with max 20-25 students) so that teachers can focus well on each student’s performance and progress. I was working hard to identify an adequate course for my daughter to prepare for the medical entrance. I am happy to say that Mystudycart team is very supportive in arranging the classes to our needs.The online classes delivered by them are very clear and helpful and it meets the expectations of the student. The faculty’s effort and teaching style is very helpful for my daughter. Thank you Mystudycart team. I will recommend my friends also…. Thank you for sending the details about Mystudycart (Sir). You are concerned about each and every class, concerned about the Test Series (to do the test on time before the due date), Thanks for sending the doubts to the teachers, sending the recordings, for giving the report of my strength and weakness in my Test. I thank each and every one of Mystudycart Team for helping me to make my classes a better one. Thank you for clearing all my doubts, for interacting, for being helpful, for being supportive, for giving positive attitude, for providing advice, for providing strategy to prepare for NEET, for telling my weak and strength points, for helping me to be interactive with the teachers. Thank you for helping me to prepare for NEET. 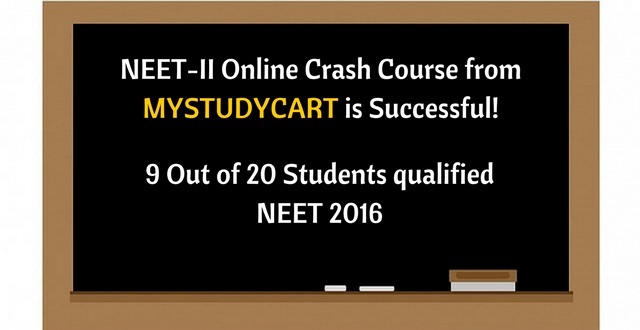 My daughter was state board student till 12th class and facing problem with NEET Preparations, but Mystudycart helped her with online coaching classes for NEET. Whatever she has performed in the exam was because of their efforts and they tried level best to help us during the NEET preparations.